Historical Marker #2384 commemorates the three Medal of Honor winners who were natives of Daviess County. John J. Given was born in Daviess County in 1840. He entered the U.S. Army in Cincinnati, Ohio, and fought in the Indian Campaigns (1865-1891). Given was awarded the medal for "bravery in action" at Wichita River, Texas, on July 12, 1870, while serving with Company K, 6th U.S. Cavalry. He died while trying to recover a fallen soldier. He was buried in San Antonio, Texas. Thomas Cruse was born in Owensboro, Kentucky, on December 29, 1857. 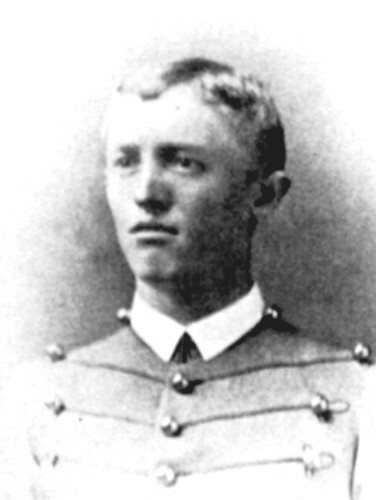 He graduated from West Point in 1879 and was commissioned second lieutenant in the 6th U.S. Cavalry. Cruse was an honor graduate of the Infantry-Cavalry School in 1891 and fought in the Indian Campaigns. He received the Medal of Honor "for distinguished gallantry in action with hostile Indians" at Big Dry Fork, Arizona, on July 17, 1882. He charged hostile Native American troops and recovered a severely wounded soldier. He received the medal on July 12, 1892. He served in numerous campaigns on the Western Frontier and later in the Philippines. He retired as a Brigadier General in 1918. He died on June 8, 1943, and was buried in Arlington National Cemetery. David P. Nash was born in Whitesville, Kentucky, on November 3, 1947. He entered the service in Louisville as a private first class in the 9th Infantry Division and fought in the Vietnam War. He received the Medal of Honor "for conspicuous gallantry and intrepidity in action at the risk of his life above and beyond the call of duty" in Giao Duc, Vietnam, on December 29, 1968. After his patrol established a position, Nash and another soldier kept watch while two other men slept. When an enemy grenade landed nearby, he shouted a warning and smothered the blast of the grenade with his body, sacrificing his life to protect his fellow soldiers. He was buried in Saint Mary of the Woods Cemetery in Whitesville. The section of Kentucky Highway 54 which runs through Whitesville is named "The David P. 'Paulie' Nash Memorial Highway." Thomas Cruse: Photo of Thomas Cruse. Medal of Honor: David Nash's Medal of Honor. 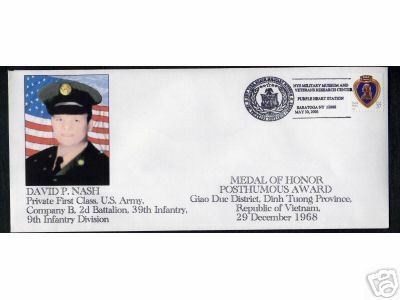 Commemorative Envelope: Commemorative Envelope with David Nash's photo and Medal of Honor information on it. Becky Riddle, “Medal of Honor Winners,” ExploreKYHistory, accessed April 22, 2019, https://explorekyhistory.ky.gov/items/show/283.